A warmer world is bringing us a greater number of hurricanes and a greater risk of a hurricane becoming the most powerful category 5. As I promised, I fired off a complaint, which at first they did their best to dodge. After my refusal to accept their reply, they have now been forced to back down. Scientists are still analysing what this data will mean, but a warmer world may bring us a greater number of more powerful category 4 and 5 hurricanes and could bring more extreme rainfall. Correction 29 January 2018: This story has been updated to clarify that it is modelling rather than historical data that predicts stronger and wetter hurricanes. Of course, we have the usual problem, that those who read the article originally and who would have been deeply misled, won’t see the correction now. What is perhaps of most concern is that this report was written by Chris Fawkes, who is one of the BBC’s weather forecasters, and who should therefore know better. How could the BBC be made to adhere to the provisions of its Charter about even-handed need, dropping its own agenda which is so inappropriate, and who could achieve that? The BBC is very even-handed in its politics coverage, but most of its other coverage is politics by proxy, which is where most of its “campaigning” takes place. For example, today a piece on radio 4 about musicians becoming political, no prize for guessing which side of politics they favour. Another example, most religious programmes used to feature men of the cloth, now they can only be described as men of the Labour party. Thankfully the obsession with the plight of migrants seems to have subsided, but only to be replaced with the current obsessions with the gender pay gap and the plight of the “under-funded” public sector. Besides the footy the BBC is essentially the broadcast wing of the Guardian. On the other hand of course, a warmer world MIGHT mean fewer numbers of less powerful hurricanes, and LESS CHANCE of extreme rainfall. Did I use the weasel words correctly? Great that you got a retraction. However, the fake-news continues to brainwash people as the “big-lie” is not really questioned. Most people are convinced that 97% of scientist believe … , the science is proven…. , polar bears are threatened …. imminent doom (well by 2100 or possible a few centuries later) is threatened by climate change …. The retractions are only read by those of us who dig into the hype. We need a Saatchi & Saatchi type publicity campaign to redress the balance, or, maybe, a Trump! There are two types of people in the world, those who believe authority and those who don’t. The latter is always a minority. Fortunately, the BBC are currently helping our children to recognize fake news when they see it. Well done Paul, a small victory, but one we must spread & quote everywhere we can. What a brave new world. I had to pause over the signatories to this pronouncement seeking to strike down the First Amendment to the US Constitution–free speech gone. Their misinformation is the threat we are under and their jack-booted methods for imparting it to all of us. Marcia McNutt (President, National Academy of Sciences)–cannot help but comment on the appropriateness of her name. C. D. (Dan) Mote, Jr.(President, National Academy of Engineering)–engineering IS NOT a science. Victor J. Dzau (President, National Academy of Medicine)–they have sold out in so many ways. If you want to want to see a group with tunnel vision, look to the medical community. So, who was it died, making them a sheriff troika? Mr Mote appears to have a beam in his eye. When in grad school in NC in the 1960’s, I did a paper on the Outer Banks. I had maps which showed hurricane tracks going back into the 1600’s and 1700’s to the present. It looked like a plate of spaghetti. Today’s Outer Banks are basically unrecognizable when compared to what they were in the 1940’s. Although I could not find that just now, I did find this site which cites a history of “memorable” hurricanes to hit this side of the Atlantic. Quite the interesting little read. Well done Paul. It takes real effort to make the Biased Bull$hit Cartel back down. See https://wattsupwiththat.com/2018/03/21/my-email-to-the-nas-nae-and-nam/ . for more on ‘misinformation’ police. Well done Paul. The next time they try to pull this fast one over hurricanes (and we can confidently forecast there will be a next time), you now have the established complaint to refer to and some chance that you can secure amendment to the article while it is still live via the “report factual and grammar errors” feature. Of course, back it up with a further complaint as well. Even if it were true that Global Warming causes increased hurricane ferocity and abundant rain, the real problem is: WHAT CAN WE DO ABOUT IT? There has never been a creditable empirical scientific study that has concluded that increased CO2 in the atmosphere causes an increased temperature! Without that attribution, mankind knows nothing about how to combat it. Words like ‘may/might/could’ are waffle words when used by climate propagandists. Keep the BS detector switched on! Not so, Sir! It was the lack of those words, the ones used by proper scientists when positing a theory, advancing research on it and trying to draw a conclusion, that alerted me to the dubious nature of much of the AGW/CC hype from a variety of sources, especially from supposed scientists. It was hammered into me when taught some science long ago that ‘good’ scientists always suggest the result of experiments and research into a theory with ‘we think’ and ‘so far in our tests’ as well as ‘may/might/could’. But your results probably didn’t drive government policies leading to billions of taxpayers’ money being frittered away. This indeed appears to be the order of the day. That is to say, there is a high probability, with very high confidence, that such words are used to lend an air of superficial, and for some irritating, alarmism to what would be upon deeper inspection, scientifically unevidenced or even irrational statements. They might just add a questionmark, but that is not good enough. Should you use “may” in the text ? as comments have said it expresses that there is uncertainty, so that is good, but its also vague. To my mind, if you can’r QUANTIFY a claim then it’s not worth making. Sir, pointing out gross error, then making the nerve centre of climatastrology advocacy back down, al beeb, is deserving of high praise. Glory, is one small victory gained, AND is all to the good. Sure, admittedly it is a relentless war of attrition – common sense versus lies and deceit – but in such a contest there can only be one winner, the truth always outs, and that truth cannot be denied by any man no matter whom. A win is a win, we mark it, as we must. Activists who used the Houston flooding caused by 50″ rains as “evidence” that CO2 is causing more rain from hurricanes are either lying or ignorant of history. ‘the Lakes’ Thirlmere was drenched by 16″ in a 48 hr period in 2015 – that’s a lot of wet but 100 INCHES in 4 days – cripes on a bike. 1. The main modeling finding continues to be that there would be fewer hurricanes overall – endorsing the IPCC position. 2. The modeling is extremely challenging and not particularly accurate wrt stronger storms…. 3. from the above “but we should not expect this trend to be clearly detectable until we near the end of the century” ie 2100. Gotta love the “Correction 29 January 2018: This story has been updated to clarify that it is modelling rather than historical data that predicts stronger and wetter hurricanes.” – as a statement of the bleedin’ obvious. The Grand National was first run in 1839, and we have a complete set of data of all the past winners, but no f*cker could predict this year’s winner from that data! How many times have you managed to get the Beeb to issue a retraction now Paul? Do you have enough to put them together into a post on the matter yet? I would have thought that enough examples together would signify Bias and deliberate lying or hopelessly incompetent journalism. Talking of journalism, didn’t the BBC send a whole host of journalists on the Ship Of Fools expedition in 2013? It was a hugely eventful trip by all accounts but afterwards non of these journalists could think of anything to write about. The Harrabin; a measure of the (almost infinite) capacity of the BBC correspondent to unquestioningly broadcast any old guff supporting the relentless march of climate change. Maybe the Harrabin / day value would be more useful to follow trends?? Always catches my attention – no reference there to AGW. Even if there was evidence that a warmer world will bring about changes in frequency, or intensity, of hurricanes (and certainly some changes will become observable – perhaps just the opposite) the scientific debate is about whether or not there is an anthropogenic influence on affecting naturally occurring GT changes. People have tweeted Paul’s article, but not yet with the words BBC corrections. Paul how come you are telling us now ? Jan 29 means the BBC corrected the page 6 weeks ago, or is that not true ? 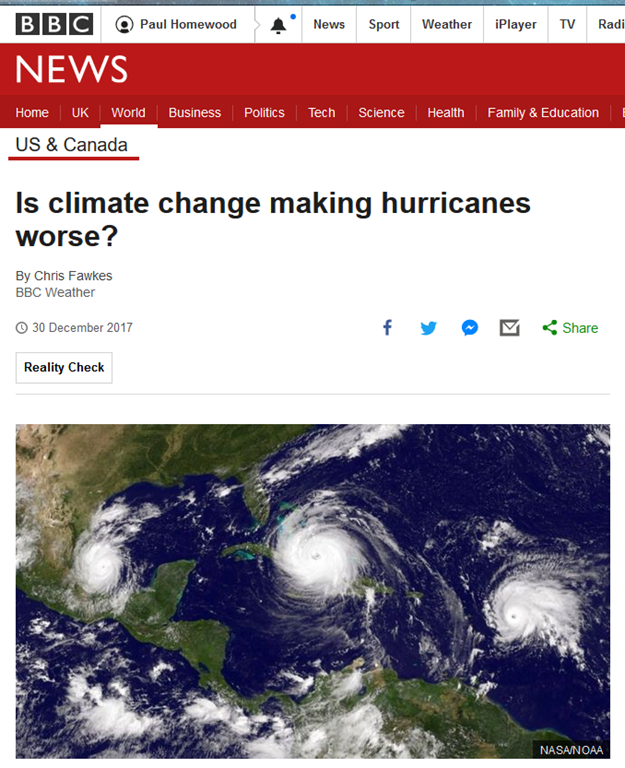 THE disturbing part is that the BBC knows unequivocally that they are creating alarm by distorting historical data and exaggerating future scenarios in order to push their catastrophic climate narrative. Congratulations, Paul. It is a long and uphill battle, but unless it is started the outcome is certain. You had better luck than me. I complained about a false radio news headline and they refuse to even discuss it.